According to ChemOrbis, players in Turkey report limited prompt availability for PP grades nowadays due to the absence of regular Saudi Arabian and Iranian suppliers. Several sellers directed their cargos to other global markets where they can obtain better netbacks which slowed material flow to Turkey. Another reason behind the constraints was reduced replacement activity on the traders’ side during the last few months in response to the steep price decreases in polymer markets since June 2014. A source from a Saudi Arabian producer stated, “We believe the market is nearing bottom and prices below $1000/ton will become less common next month. We are receiving more inquiries but our allocation is short due to production problems in Saudi Arabia and poor netbacks to Turkey.” A trader offering on behalf of a regional source also reported, “We are receiving more inquiries from the market as locally-held availability is tight. However, as we diverted most of our cargoes to Asia, we do not have anything to offer to Turkey for now.” A Saudi Arabian producer, meanwhile, will implement a maintenance shutdown at their 400,000 tons/year PP plant in Saudi Arabia in February. Duty-free South European and Egyptian cargos were mostly sold out for January, players said. Moreover, some additional volumes for late January were dealt $20-40/ton higher on the week for Egyptian raffia and fibre cargos. 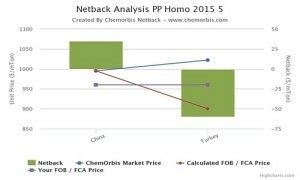 Iranian PP offers were also scarce with fibre prices below $950/ton CPT not being repeated widely so far this week in Turkey. “We sold some material in big bags at this threshold before we managed to sell with $50/ton gains amidst lack of availability from some Iranian producers,” a trader noted. According to ChemOrbis, on another note, some buyers argue that weak activity in end product markets combined with lower energy prices may overshadow PP supply limitations. Plus, they believe that PP sellers may return to Turkey to sell once China enters the New Year Holiday next month.